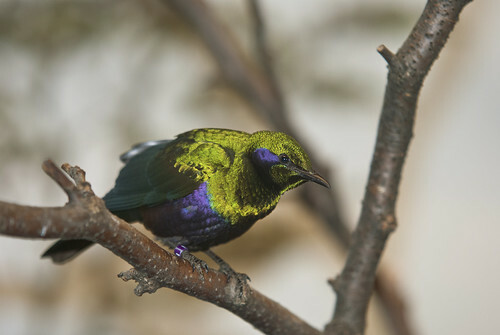 Named for its vibrant colors, the emerald starling has green, iridescent feathers on its chest and wings and purple markings on the belly and around the eyes. Common. 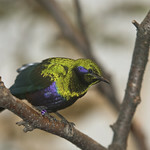 Lincoln Park Zoo cooperatively manages emerald starling populations with other institutions in the Association of Zoos and Aquariums. 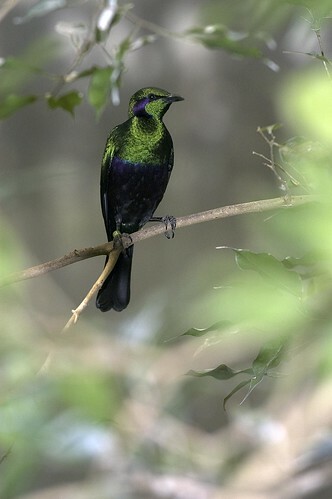 The emerald starling catches insects in flight and also uses its strong beak to probe for insects and seeds in soil and heavy vegetation. In the wild, the species lives in flocks of 15-20 members; these flocks occasionally gather to form larger groups. 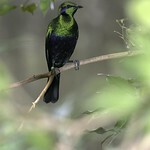 The emerald starling locates its nest in small holes found in tree stumps or trunks. The male and female cooperate in building the nest from leaves, and both bring food to chicks after they hatch. Females possess a brood patch—a spot on their stomach lacking feathers—that helps them transfer body heat to their eggs.